Our scallop trips in Homosassa begin with a boat ride down the scenic Homosassa River to the Gulf of Mexico. 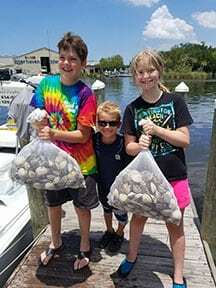 Your scallop charter captain Mike Zeigler will set you up with a great spot to collect your scallops. 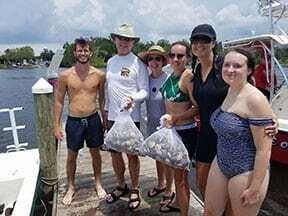 Scalloping in Homosassa is expected to be very good this year. So come on out and enjoy Scallop Season with us. and the required state license. You are welcome to bring your own equipment if you like. You are allowed a cooler however, nothing over sized (standard cooler is ok),sunblock, hat, and polarized glasses. Once you have your share of these tasty morsels, you can clean them yourselves or as we highly recommend, you can have the local scallop cleaning crew do the dirty work for you for a small fee. Call now to book your charter!